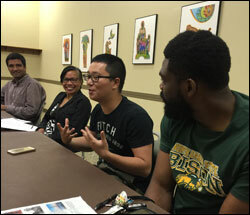 Graduate students in transportation and logistics and several from the NDSU Graduate Student Council are improving their communication skills through monthly study and discussion in a "Mastermind group." The "Everyone Communicates, Few Connect" John Maxwell mastermind is being facilitated by Jill Hough, an associate professor of transportation, at NDSU's Upper Great Plains Transportation Institute. Mastermind groups offer brainstorming, education, goal-setting, peer accountability and support in a group setting to sharpen participants' skills. "Managers, CEOs and other leaders indicate that communication skills are critical to personal and organizational success," Hough noted. "This effort is designed for students who want to take their skills in communication to the next level." The mastermind was originally offered solely to transportation and logistics students, but was then expanded to include others. Students began meeting in June and will meet once each month through October. Jody Bohn Baldock and Brian Fuder are assisting in facilitating the effort. Baldock is assistant to the UGPTI director and Fuder is a technical training engineer with UGPTI. Transportation and logistics students enrolled include: Ali Rahim Talequani, Fangzheng Yuan, Chijioke Ifepe (CJ), Dilip Mistry, Hamad Al Qublan, Muhammad Khan, Fesseh Gebremikael and Anne Campbell. Rosalinda Connelley is a doctoral student in education. Arsalan Azmi is a graduate student in construction management. Asif Arshid is a doctoral student in civil engineering.